I actually wanted to put the title as ‘Travel Sector continues to remain the only e-commerce friendly sector in India’ for obvious reasons we all are aware of but thought a little optimism won’t hurt. Travel Sites are now reaching more than 1/3rd of the Internet population in India with leading travel sites all witnessing double-digit growth to their websites. IRCTC continues to top the list of travel e-commerce websites with 7.7 million visitors which is understood since rail transport is indeed the most commonly used mode in India. Moreover, IRCTC has launched a flight booking service this year which should further boost the numbers for IRCTC should the service pick up. 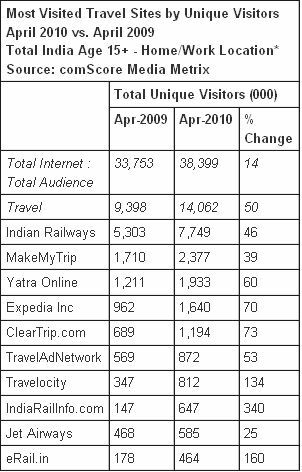 MakemyTrip enjoys the second spot but is way below IRCTC with close to 2.4 million visits. This could be understood from the fact that the target customer base for air tickets is considerably smaller. However, with Bus ticketing and the newly launched Rail Ticketing launched, Makemytrip would be aiming at eating a significant share from IRCTC. The report highlights another interesting fact concerning the visitor behavior on these travel sites. 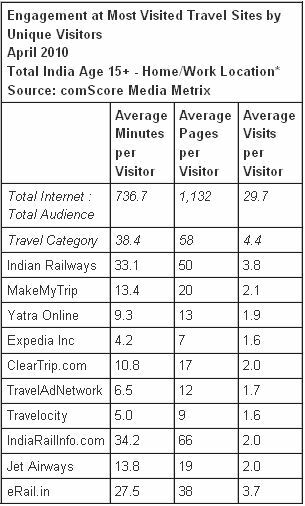 Travel sites in India witness strong engagement levels with major websites averaging >10 minutes per visit which is phenomenal. One look at the stats and it definitely shows that users like to explore the travel websites to their heart’s content while they are at it. One possible reason is definitely the search for the Best Deals specially for booking air-tickets. I can personally vouch for the fact that the air-ticket availability and the price vary significantly on different travel portals and that surely adds to the increased visits to multiple sites and increased time spent on travel wesbites. However, i fail to understand 33 minutes per visitor(average) spent on IRCTC. There is no comparison needed on it with train ticket prices constant. Moreover, even on other travel websites the time spend per visit is high. Could the high time spent be a function of the usability (speed/navigation) of these travel websites. The observation is intuitive and i don’t have hard numbers to prove the same but there has to be an element of complexity involved which might be making it difficult for the average user to find his/her around the site. What do you think? All said and done, the growth for travel websites is heartening and brings hope for the e-commerce industry in India. But, other sectors ( merchandise, books, clothes) have never managed to leverage the e-commerce model that well in India. Could it be the Touch and Feel Before Buying mindset which makes it difficult for the adoption of e-commerce portals in India? Trainenquiry.com adds real-time Fog related Train delays! There are couple of factors defining reason behind high market share for IRCTC with respect to rail ticket booking. 1. Traditionally, railway tickets booking have long been done through over the railway ticket counters, and there was hardly any private involvement allowed. With IRCTC (an Indian government initiative) coming in picture, it was rather seen as an genuine extension to conventional booking system and so was quick to get traction with train travellers and ticket booking agents. 2. And, so it was again pretty obvoius that, if there would had been any first online rail ticket booking system in India, it should had been an government organization, because apart from issuing the tickets online the most critical aspect of this system was to create a conducive environment necessary to ascertain vailidity of travellers booking ticket online. Well, answer to that is very simple, IRCTC – A government of India Enterprise. Isn’t that actually how government system operates, every upgradation or renovation request has to pass through series of babu approvals, even if particular unit is self-sustaining and highly profitable. Furthermore, I am very certain that upgradation is less likely to top there priority list even in near future and you don’t have to go any farther to understand this, simply look at the newest sibling in there stable – IRCTC Airline booking system. The high amount of time spent on IRCTC is pretty straight forward. As you mention the price is constant and not a parameter (like in air or hotels etc.). The only reason is the scarce availability of train seats/berths and the cumbersome UI/flow of IRCTC which makes a person do multiple searches to figure out availability position for various train – date – class combinations. And IRCTC does not leverage caching to its optimum. Hence every time one needs to check availability for a particular train-date-class combo, one needs to wait for a few seconds. A valid comment but i doubt if any website will reveal that due to obvious reasons. But, given the high number of minutes of time spent on the website i presume there might be decent conversion. It would be useful to kow what percentage of visitors are actually purchasing tickets through these sites.